"The songs of Serge Gainsbourg revisited by some of today's most influential artists." French "Edition Limitée" 2-CD set issued in FNAC stores only, comprising the CD album plus a bonus CD featuring an exclusive track and a Serge Gainsbourg interview. 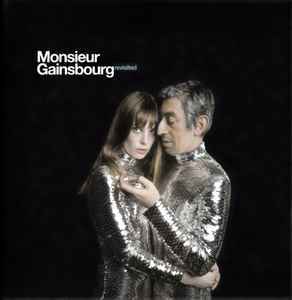 The CD album and a 16-page booklet are presented in a gatefold square card sleeve (identical to Various - Monsieur Gainsbourg Revisited) and the bonus CD in a card wallet. Both are sealed together, and a large sticker is applied on front. The bonus CD was not given or sold alone, but only available in this package. The back cover reads "Ce CD vous est offert par la FNAC" ("This CD is given to you by FNAC"). Track 1-1: recorded at Officine Meccaniche Recording Studios di M. Pagani, Milan. Mixed at the Pierce Rooms, London. Track 1-2: recorded at Stratosphere Sounds, New York City, & Zero Return Studio, Atlanta. Track 1-3: recorded at Studio Labomatic, Paris. Track 1-4: recorded at Ade's house, State of Art. Track 1-5: recorded at David's studio, London, & Studio Labomatic, Paris. Track 1-6: recorded at Stratosphere Sounds, New York City. Track 1-7: recorded at Brown Punk Recording, Los Angeles. Track 1-8: recorded and mixed at Studio Labomatic, Paris. Track 1-9: recorded at Studio Ferber. Track 1-10: recorded at Toxic Studios & The Bedroom. Mixed at RAK, London. Track 1-11: recorded at RAK, London. Track 1-12: recorded at Telstar Studios, Munich. Track 1-13: recorded at Miloco Studios, London. Track 1-14: recorded at Studio Labomatic, Paris. Tracks 2-2 to 2-19 are excerpts from an interview given by Serge Gainsbourg to Les Inrockuptibles in October 1989 and previously released as Vu De L'Intérieur (Interview 1989) in 2001. 2-1 ℗ 2006 Barclay, a division of Universal Music France division. ℗ 2006 Barclay, © 2006 Barclay, a Universal music France Division.